A short hop from Chiang Mai puts you in the backyard of one of the region's most famous and sought-after inhabitants: the Asian elephant. Few creatures garner as much intrigue and wonder. And the national symbol of Thailand are revered for their strength and longevity, and in some cases worshiped for their association with Buddhist and Hindu beliefs. Once ubiquitous in Thailand, fewer than 2,000 wild elephants remain. To have the privilege to spend the afternoon with them is an incredibly special and memorable experience. 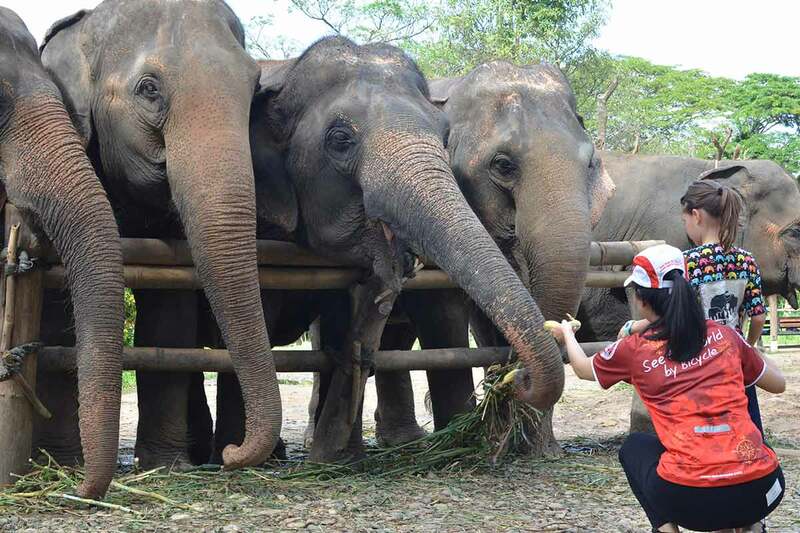 SpiceRoads practices responsible tourism, and was one of the first companies in Thailand to sign the World Animal Protection pledge for "animal safe" tourism. The elephants on this tour live in a retirement home, and spend their days being fed, photographed, and bathed by tourists- not ridden. The day begins with a visit to to an innovative, eco-friendly initiative that takes an elephant by-product and turns it into paper. From there, it's onto the bikes for a ride through orchards, rice fields, and even some forest, on the way to the elephant sanctuary. The ride is a gentle, flat 32 km on quiet sealed country roads, and on some smooth dirt lanes. This trip is fully supported and you will have a constant supply of cold drinks and fresh fruits. Your guide is an expert of the area and terrain means you can always know what is coming up in terms of distance. We will pick you up from your hotel at 8 am and drive north to Mae Rim where we walk through the eco-friendly outdoor museum of Elephant Poopoopaper Park. With our handmade sustainable souvenir it is time to go and see the makers of the poo fibers. We cycle for 32 km on paved and dirt roads through small villages, bamboo forests, mango and banana orchards to the elephant sanctuary. Cycling there through the countryside will help to build up your appetite and we stop for lunch enroute. Once at the elephant sanctuary we will change into a uniform before meeting the elephants and learning about their stories. Soon it will be time to get muddy with the elephants as you apply a mud treatment to their skin and then join them in a bath and brush them clean as they wade and play in the water. Please bring a hat, bathing suit, towel and a change of clothes. A transfer back to your hotel ends our tour with an expected time of arrival around 6 pm.